Intricate and luxurious cosmetics brand, Rouge Bunny Rouge, twists opulence and beauty with embellished detailing to deliver a range of color make up that embraces both romance and whimsy. Wearable, blend able and adaptable formulas and shades are at the very heart of Rouge Bunny Rouge. The formulas are absolutely outstanding and have been sourced from the world's most sophisticated laboratories. 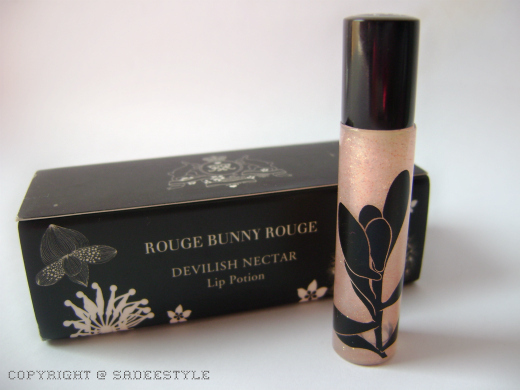 I'm very delighted to share my review with you about Rouge Bunny Rouge lip potion which comes in lovely packaging you will defiantly fall in love with this product when it will reach to you. It's a most stylish and professional packaging i have even seen of any product. When i got it i felt like that i have received a tiny treasure in a small box. It's actually a plumping lip gloss with Cloves, Cardamom and Chili which will stimulate the blood circulation and will moisturize lips also will give the rosy glow to the lips. it contains a mica just to bring more glamour and little bit shine. 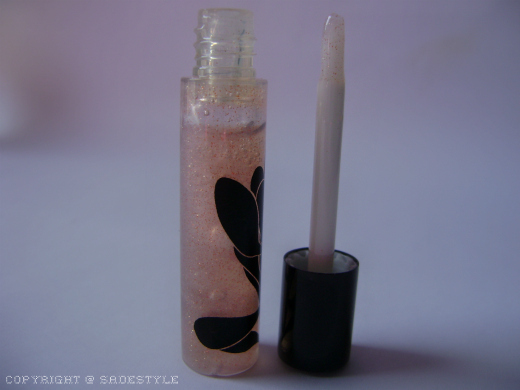 it's not just an ordinary lip gloss it also will moisturizer and nourish your lips and you will feel slight tingling and pluming one the lips its particular formula is very thick in consistency but amazingly not sticky. it looks great, but the price is quite high. looks stunning!!! perfect winter lip colour! love the packaging and its texture -- beautiful!!! love! thanks for sharing sadee.. IMY!